Compact in size but loaded with powerful rangefinding features, the Bushnell Medalist sets a new standard in a complete rangefinder package. Like its predecessor--the PinSeeker 1500--the Medalist is equipped with PinSeeker technology to combine pinpoint accuracy and consistency enabling you to range up to 300 yards (±1 yard) to the flag without the use of reflectors. 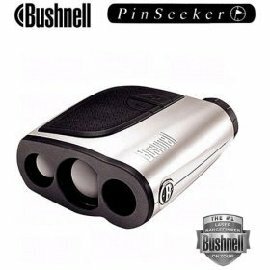 Designed exclusively with the bottom of the cup in mind, Bushnell's Pinseeker mode allows easy acquisition of the flag without inadvertently capturing background target distances. When more than one object is acquired, the closer of the two objects is shown on the LCD screen. Powered by a 9-volt battery, the lightweight Medalist boasts a 4x magnification and features a rubber armoring, making it easy to grip. It also comes with a premium carrying case. Weighing just 9 ounces, the Medalist measures 1.7 x 4.5 x 3.8 inches in size and is ready to be used right out-of-the-box, allowing it to be played at 100 percent of the courses around the world. The Medalist is legal for tournament play and for posting of scores for handicap purposes. Other features include distance readings in both yards and meters and standard SCAN mode. SCAN: Allows you to pan across the landscape while viewing a continuously updated LCD display of the distances between you and the targets you scan. Rain: Compensates for precipitation to guarantee an accurate distance measurement through rain or snow. Last updated: April 20, 2019 at 11:49 EST. Pricing information is provided by the listed merchants. GoSale.com is not responsible for the accuracy of pricing information, product information or the images provided. Product prices and availability is subject to change. Any price and availability information displayed on amazon.com or other merchants at the time of purchase will apply to the purchase of the product. As always, be sure to visit the merchant's site to review and verify product information, price, and shipping costs. GoSale.com is not responsible for the content and opinions contained in customer submitted reviews.